Hi jerokuhne, this is Alan. Thank you for giving the information.It helps a lot. But it still needs other information to confirm the problem. 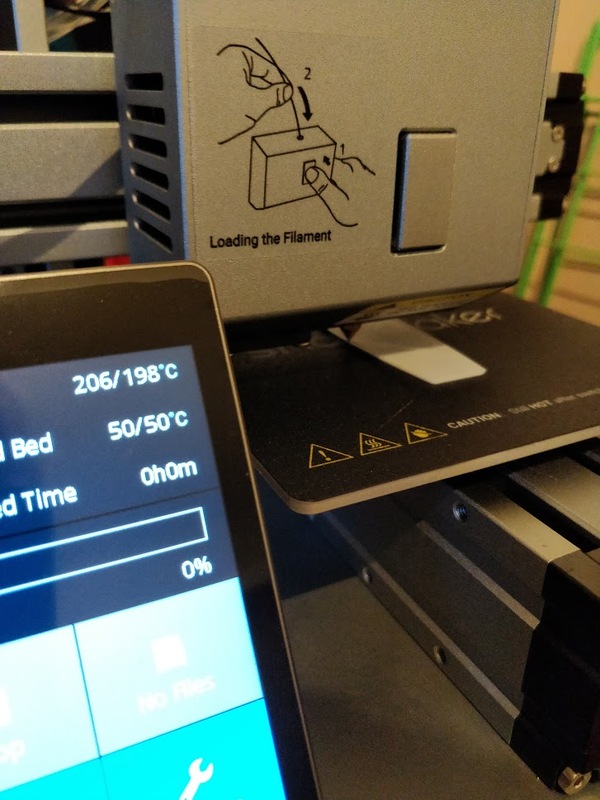 Seems that it should start printing but it does not do anything but stay heated and idle. Can you try print via the latest version snapmakerjs? When the temperature is ready, the controller will wait a few second, and the terminal on snapmakerjs will print the temperature status per second. Can you capture the terminal if the machine stay heated? Hi @Alan, thanks for your respond. I’ve captured 10 minutes from the terminal and the firmware is on 2.5. T:71.4 /200.0 B:22.6 /50.0 B@:0 @:0 W:? T:70.9 /200.0 B:22.5 /50.0 B@:0 @:127 W:? T:70.4 /200.0 B:22.5 /50.0 B@:0 @:127 W:? T:70.9 /200.0 B:22.9 /50.0 B@:0 @:127 W:? T:72.9 /200.0 B:22.9 /50.0 B@:127 @:127 W:? T:75.3 /200.0 B:22.6 /50.0 B@:127 @:127 W:? T:80.6 /200.0 B:23.0 /50.0 B@:127 @:127 W:? T:87.7 /200.0 B:23.6 /50.0 B@:127 @:127 W:? T:93.4 /200.0 B:23.3 /50.0 B@:127 @:127 W:? T:103.3 /200.0 B:23.5 /50.0 B@:127 @:127 W:? T:110.8 /200.0 B:24.3 /50.0 B@:127 @:127 W:? T:123.1 /200.0 B:24.9 /50.0 B@:127 @:127 W:? T:136.1 /200.0 B:25.3 /50.0 B@:127 @:127 W:? T:145.0 /200.0 B:25.3 /50.0 B@:127 @:127 W:? T:159.2 /200.0 B:25.8 /50.0 B@:127 @:127 W:? T:169.1 /200.0 B:26.7 /50.0 B@:127 @:127 W:? T:184.3 /200.0 B:27.1 /50.0 B@:127 @:127 W:? It seems like the nozzle temperature couldn’t stay in target temperature. I think there are two possibilities.One is the cooling fan( inside the 3D printing module ) couldn’t cool down the nozzle enough. Another possibility is the heating tube needed to be replaced. In my opinion, you can check the cooling fan inside the module first.If the fan is working fine, then may be the heating tube. Maybe the thermistor is not in the middle of the hotend. I’ve came to the conclusion that due to bending the cable of the thermistor and heating tube it was out of the middle. However it did not change much, but I had opened up a window at the heating process so maybe that helped out cooling the hotend. Either way, I’m really happy it’s printing at the moment and so far it’s looking good! I would not really count this as a trouble shooting, but I did not really know where else to put this. If you make your own encloser with a door, would you be able to make the laser not work until the door is closed like the encloser you buy off the snapmaker sight or not? I need help with my Snapmaker! I have several software/firmware issues. It doesn’t recognize any USB drives. I tried everything, they are in FAT format etc. When I tried to calibrate the 3D printing module today it centered 2 cm to the side where it should center. Is there any way to make an hard reset of the firmware? And I have also an hardware problem. The connector to the heated bed just went off. I soldered it back in place but don’t know if it will hold for much time. Is there any heat resistant glue or something I could put on it? For issue #2, you might want to check that everything is attached through the correct mounting holes. Yes, it is! Anyone has solution for the first issue yet? Has Cura recognised your printer and is connected to it? Alas I can offer no more suggestions as i use Windows OS. I suspect it is your Mac. Do you have another system that you can try it on? 1* Ik gebruik Cura en maak enkele kopie’s of voeg kleine stukken samen (zorg dat de totale oppervlakte niet groter is dan het bed van de Snapmaker). Schrijf dit totaal bestand weg als een GCode en laad het in Snapmaker3D. - Open opgeslagen bestand in Snapmaker3D en drukken maar. Seems you are the lady in the know around here. Just tried to upload a video but failed due to being new. 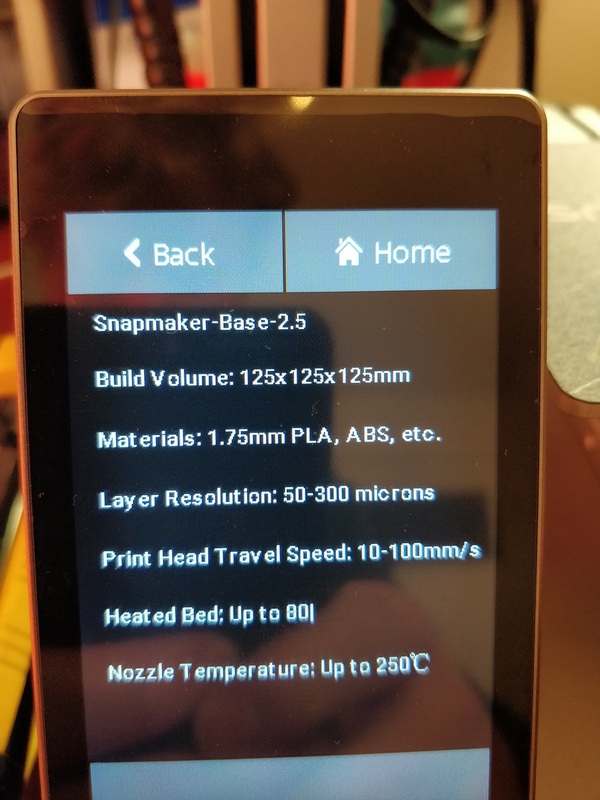 My Snapmaker arrived yesterday, set up was pretty simple and strait forward until I went to calibrate the 3D printing module. Initially the all X, Y and Z axis appeared to be working, upon calibrating the Z axis would not go down enough to reach the print bed. Exiting the calibration via either saving or going back reset the homing point, however the homing point was roughly 10mm higher than it was previously. And every time it finds the homing point it is another 10mm higher. Back in jog mode again, the Z axis will only go up, not down. It will go up past its means to, and start clicking a rather nasty click. Its interesting though because for every 10mm I push it past the Z+ it will then go down 10mm. I updated the firmware to 2.6, and the problem persisted. Then 2.7 and it had Z- and Z+ movement again, until starting the calibration process, then the same problem. I have tried switching the ports between 4 and 5, swapping the linear modules, power cycling with the Z axis in its min and max positions. Still no joy. Thanks for your help. I have read though a lot of your posts and they have been most informative. Oh and if it helps narrow it down, it’s the model with the smaller screen. Are you sure that you didn’t mout the Z-axis upside down? Ha, yes I’m sure. Quick update. I have managed to isolate the issue. The parameters of the z axis can be reset by positioning Z at 0 and switching the X to port 4. Z+ then Z- in jog mode and swap the X from port 4 back to its original position. The Z axis then behaves normally and calibration can be achieved. The problem of homing 10mm higher every time persists though. Temperamental at best. Managed a couple of decent prints now though. Calibration needs work, possibly controller issues. Same issue here. Haven’t tried what you described yet. Has anyone communicated another fix or the source of the problem yet?